It was an old leather book that I recently acquired from a local Friends of the Library bookstore. 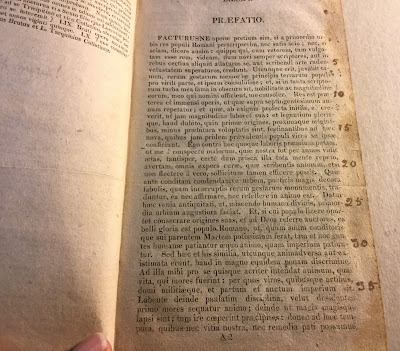 It contained the first five books of the History of Rome by Titus Livius (Livy) (59 B.C.-17 A.D.) The entire text, however, was in Latin, a language that is Greek to me. But I would want the book anyway. The book, published in Utica in 1821, was the third edition of Livy's Historiarum that William Williams, the largest publisher west of Albany at the time, published. His name rang a bell. I remembered reading a paper about him by the bibliophile and author Madeleine Stern. But that wasn't the reason why I wanted the book. The book itself was formerly owned by a Thomas Williams, who wrote his name on the title page. I googled "Thomas Williams" and I got "about 1,580,000 hits. There were many people by that name, including a novelist, a theologian, and even a Thomas Williams who came to America on the Mayflower. 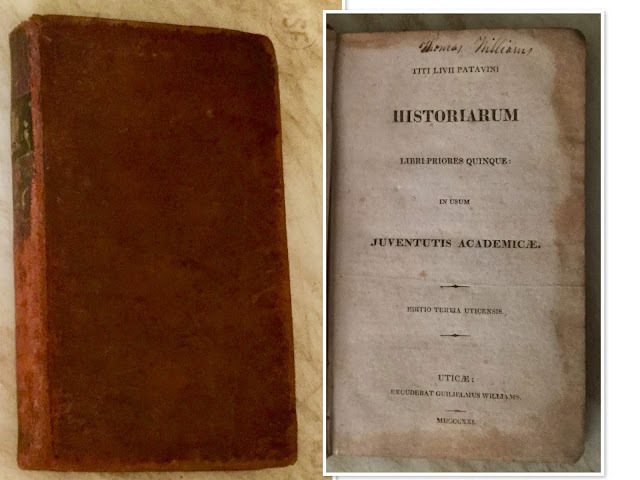 But the Thomas Williams I was looking for acquired a copy of Livy's Historiarum while attending Dickinson College in September 1822––at least, that's what he wrote on the front pastedown of the book. 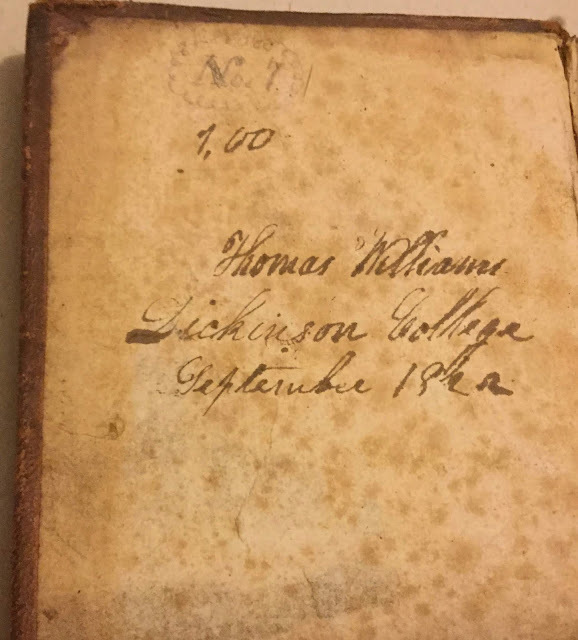 Now this Thomas Williams who went to Dickinson College was the reason why I wanted the book. When I find a President of these United States asserting kingly powers, claiming the force of statutes for his proclamations, living in habitual contempt and violation of your laws, suspending their powers or trampling them under foot, bartering away untold millions of your property for rebel use, claiming to rule without a Congress, insulting the legislative power and defying its authority, and ruling this nation as if he were its master, so help me God, I will uncrown him if I can. To learn more about him, I acquired a copy of The Life and Speeches of Thomas Williams: Orator, Statesman and Jurist, 1806-1872, A Founder of the Whig and Republican Parties by Burton Alva Konkle, Philadelphia: Campion and Company 1905. And yes, the portion of his speech above was from Konkle's biography, volume II, page 651 to be exact. Williams was giving his reasons why he believed that President Andrew Johnson should be impeached. Williams himself became one of the ten "prosecutors" in the President's impeachment trial. For me, reading Konkle's historical account of the life of Thomas Williams was a lesson in American history. Konkle used the speeches of Williams and copies of government documents to cover the rise and demise of the Whig Party, the formation of the Republican Party, the Civil War, the Reconstruction Period thereafter, and then the impeachment trial of President Andrew Johnson. I knew that the Senate was one vote shy of impeaching the President, but I never really knew why Congress tried to impeach him. Konkle, however, laid it all out for me, using almost 100 of the 757 pages to enlighten me. It all had to do with Reconstruction versus Restoration. Thomas Williams and other Republicans believed that the rebel states had to jump through several hoops and hurdles and then some before being readmitted to the Union. Congress passed the Military Reconstruction Act on March 2, 1867. This act divided the rebel states into five military territories under the administration of the Secretary of War, Edward M. Stanton. President Andrew Johnson, on the other hand, believed that the rebel states should be immediately readmitted to the Union. He believed the Military Reconstruction Act to be unconstitutional and vetoed it. But Congress overrode his veto. Thomas Williams and President Andrew Johnson were playing a chess game, so to speak. But Williams thought several moves ahead. Williams surmised that the President would fire Secretary of War Stanton and replace him with someone more favorable to his state restoration viewpoint. So Williams introduced the Tenure of Office Act in March 1867. This act required the Senate's consent before the President could dismiss a Presidential Cabinet member. The President, of course, vetoed it, but Congress overrode his veto. The President then tried to fire Stanton and replace him. So Congress tried to impeach him. The rest is history. And well worth reading. 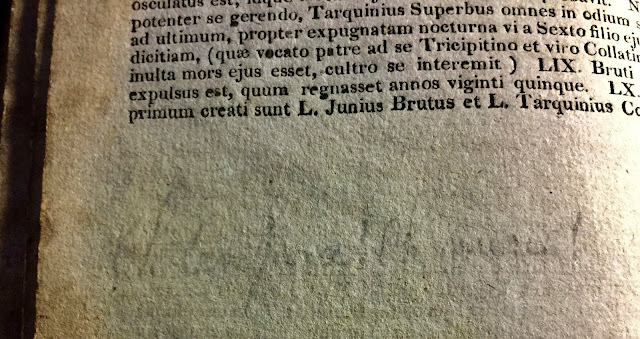 The name of Thomas Williams appears one more time in his copy of Livy's Historiarum, along with two other names. It was not written in his hand, but in the hand of one of his sons. And in pencil at that! Livy's book was used as a rite of passage when someone in the Williams family first entered college. Thomas Williams entered college at Dickinson College and acquired this copy of Livy's book in September 1822. Thomas Williams Jr. entered college at Western University in 1848 and his father gave him this copy of Livy's book. 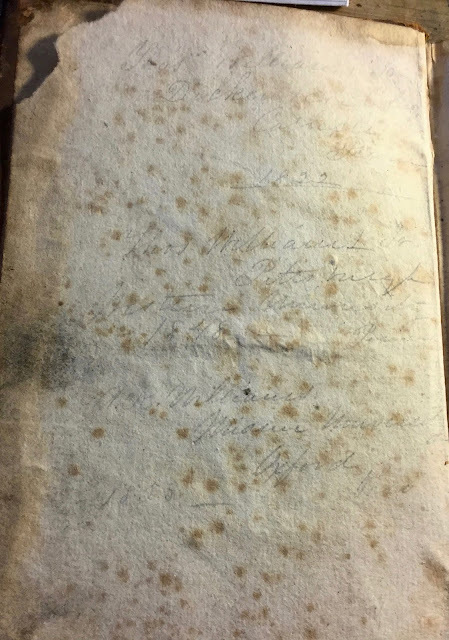 Thomas Williams Jr. was a student himself at Miami University when he passed Livy's book onto his brother Alexander R. Williams (when Western University burned down for the second time in four years in 1849, Thomas Williams Jr. transferred to Miami University). All three owners of Livy's book made notations in the book. The notation of Thomas Williams on the second page of the epitome (page 4) is barely visible and practically indecipherable. The notations of Thomas Williams Jr. are easier to decipher. He identified every fifth line of the first fifty-one pages of the book. The notations of Alexander R. Williams, although easy to read, required the assistance of a Google search to decipher. Alexander was a merchant in Washington D. C. And what we wrote on the rear pastedown of the book were the names of merchant ships. Go figger! In his book, Konkle refers to a "Williams Collection." 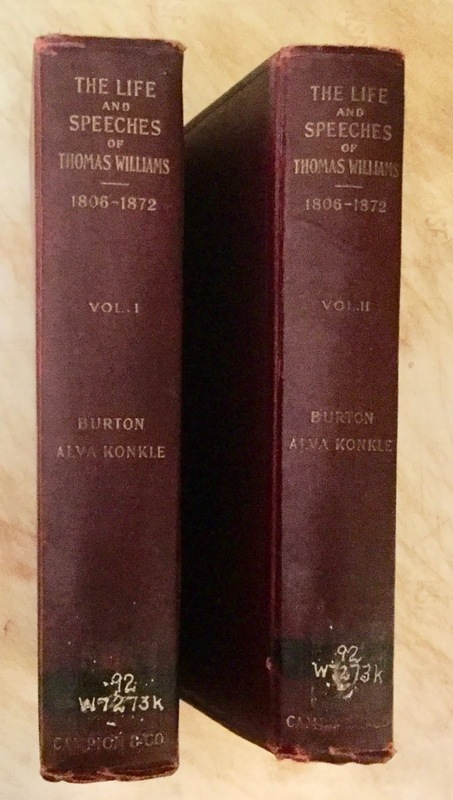 Because Konkle's book was published in 1905 and, because Konkle mentions the Livy book by name, the book must have made it back home to the "Williams Collection." 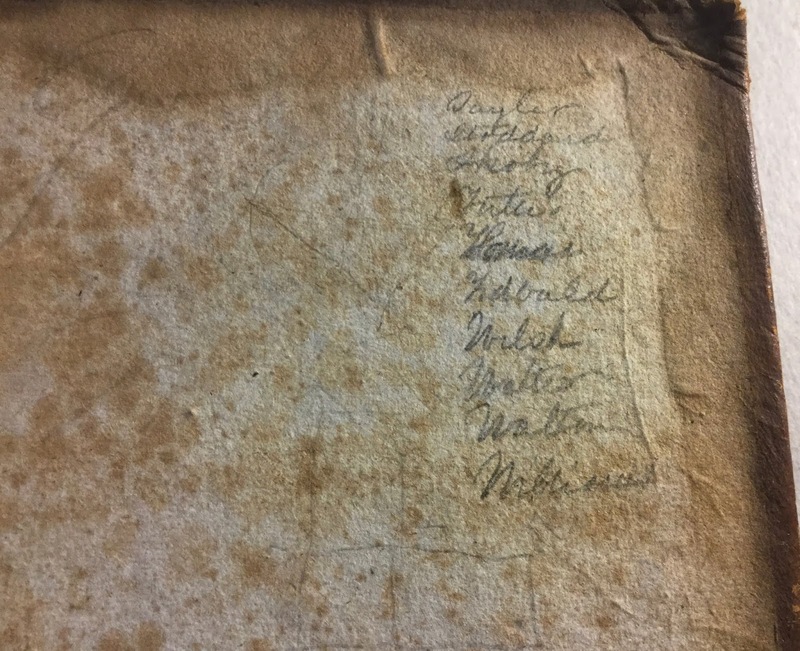 There are no university library markings in the book so I believe that Livy's book remained in the family library until the books of the Williams Collection were eventually dispersed by one of his descendants. Shortly after Thomas Williams passed away on June 6, 1872 in Allegheny, Pennsylvania, The Dispatch wrote that "few men leave such extensive or judiciously selected libraries as that which is numbered among the deceased. He delighted in books of travel, but abhorred novels, or fiction in any form." Mr. Williams' love for history is indicated in some degrees by the fact that his library contained about 400 volumes on that subject alone. It is also suggestive to know that there were over 200 volumes on voyages and travels, nearly the same on religion and theology, while it might readily be surmised that he would have above 100 on poetry and the drama and a like number on rhetoric and belles lettres, or nearly that many on ethics and politics, which he classes together. The possession of about 200 volumes of the best fiction, wit and humor would not indicate that he 'abhorred' fiction in any form hardly. 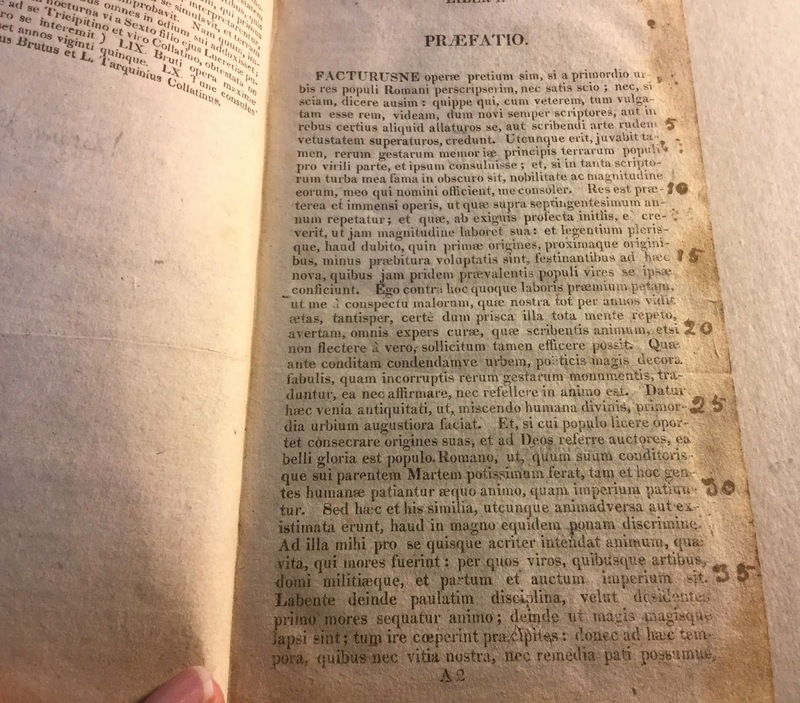 The number of volumes do not, however, make the impression on one that their high character do, of course, and the really significant fact about it all is that he made great books his companions. Addendum: Nicholas Smith deciphered Thomas Williams' notation. It's from Cicero: O tempora! O mores! (Oh, the times, Oh the customs). Very interesting. 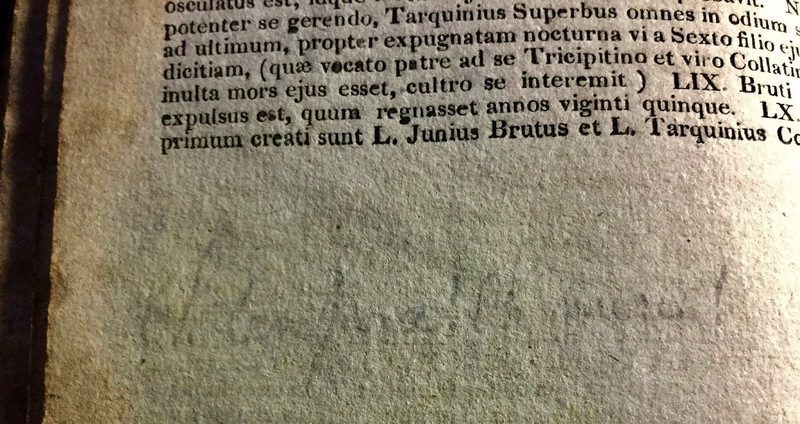 Could the faint pencil annotation be O tempora O mores (Cicero)?